Are you ready for today's super blue blood moon? The Telegraph describes it as "a once-in-a-lifetime event". The Mirror thinks "we're set for quite the celestial show". The Sun says it'll "appear significantly bigger than a normal full moon". The Independent reckons "the moon is about to do something it hasn't done for 100 years". The Express awaits "a pretty amazing sight, the likes of which hasn't been seen for 150 years." 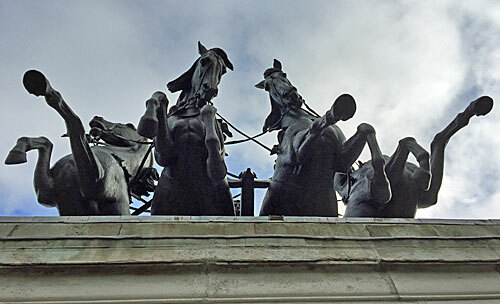 The Guardian promises "a moment not seen in the skies in more than 150 years". But is an amazingly rare huge bluey-red moon about to appear in the sky? Or is this nothing more than journalists with a shaky understanding of astronomy bashing out a clickbait story because all their rivals have? Spoiler: it's the latter. Let's start with the supermoon part. Fifty years ago supermoons didn't exist, or at least the phenomenon did but nobody had given it a name. The man who came up with the definition was Richard Nolle, and he's an astrologer, which should start to suggest why "supermoon" is a mighty shaky concept. Supermoons are full moons which look bigger than normal. According to Richard, a supermoon is "a full moon which occurs when the moon is within 90% of its closest approach to Earth in a given orbit". 90% is a wholly arbitrary limit, but this generous percentage means supermoons crop up more frequently than the name would suggest. Today's supermoon, for example, follows supermoons on 2nd Dec 2017 and 2nd Jan 2018, and three more will be along early next year. Officially the moon's closest approach to the Earth is called perigee, and its timing varies month by month, so has nothing to do with whether the moon is full or not. In the moon's current orbit perigee was yesterday, and the full moon is today, and that's close enough to count. To throw some actual numbers at this, the moon's average distance from the centre of the Earth is about 385,000km. This year it gets closest on January 1st (356,566km) and is furthest away on January 15th (406,461km), a gap of about 50,000km. Calculating 90% of this interval requires a supermoon to be within 361,500km of the Earth. The full moon this afternoon occurs when the moon is 359,900km away, which is less than the target number, and that's why it's a supermoon. The "exciting" thing about a supermoon is supposed to be its size. The moon's at the closest point in its orbit, so appears larger in the sky, and that's supposed to make us go wow. Compared to a full moon taking place when the moon is at its furthest point, the diameter of the lunar disc is indeed 14% larger, and shines about 30% brighter. But compared to an average full moon it's only 7% larger, and 14% brighter, and compared to the last two full moons it's pretty much the same size. Your mobile phone will still take a crappy photo, and if you think you can genuinely perceive the difference with the naked eye you're probably wrong. Indeed a completely separate phenomenon called the "moon illusion" kicks in when the moon is very close to the horizon, so you can always trick your brain into thinking any full moon looks much bigger than usual. Let's move on to the blue moon part. There are two definitions of a blue moon, one of which has surpassed the other. Originally a blue moon was defined as the fourth full moon in a single season (when normally there'd be only three). But more recently it's come to mean the second full moon in a calendar month, after a journalist misunderstood the concept in 1946 and everybody preferred his simpler explanation. Full moons occur every 29½ days, which is how this month we had a full moon on 2nd January and are getting another on the 31st, the second being the blue moon. But this doubling-up doesn't happen very frequently, because 29½ is very close to 31, hence the expression "once in a blue moon" meaning not very often at all. The original, seasonal definition of a blue moon comes from a time when our ancestors gave full moons names. For example, the first full moon after the autumn equinox was the Harvest Moon, the second was the Hunter's Moon and the third was the Cold Moon (or some other name, depending on what kind of ancestors you had). But if a fourth full moon squeezed in before the winter solstice then another name was needed, otherwise it'd shift the names for winter moons out of sequence, and so the third in the sequence became a Blue Moon. By this measure there are no Blue Moons this year, the next being on 18th May 2019. By the modern definition, a blue moon comes around roughly every 2¾ years (technically, seven times every 19 years). The last time we had a blue moon was in July 2015, before that September 2012, and before that March 2010. But the next one isn't very far away at all, and all because February has less than 29½ days. This means the next full moon will be on 2nd March, and then we get another on 31st March, so that'll be another blue moon. Poor old February gets no full moons at all, and the phrase "once in a blue moon" turns out to mean "in two months time". One further catch. Today's blue moon isn't a blue moon everywhere. The precise time of the full moon is 1.26pm GMT, which is fine in Britain, but in New Zealand it'll be after midnight on Thursday. That means New Zealand doesn't have a blue moon today, but does have a full moon in February, and the same goes for various other Pacific islands. Sometimes this happens on the other side of the dateline, so for example a full moon at 1.02am GMT on 1st June 2007 became a blue moon in the Americas, where it was still May at the time. Most importantly, a blue moon is never blue, it's merely a quirk of the calendar. And that means going outside specially to observe a blue moon is pointless, because there's literally nothing out of the ordinary to see. And finally the blood moon part. A 'blood moon' is simply another phrase for a total lunar eclipse - a phenomenon that's properly interesting without the need for hyperbole. What's happening this afternoon is that the Earth will pass directly inbetween the sun and the moon, and so will blot out light on the lunar surface. The moon never gets properly dark, because some light gets refracted through our atmosphere, and when that light is reflected back towards us it's taken on a coppery hue. Under optimal conditions the moon can appear eerily red, but don't expect to see a gory disc hanging in the heavens. Total eclipses of the moon aren't as stunning, or so rarely seen, as their solar counterparts. Whereas a total solar eclipse can only be seen from a very small sliver of the Earth's surface, a total lunar eclipse is visible from the entire half of the Earth facing the moon, cloud permitting. A total solar eclipse also never lasts more than a few minutes in one location, whereas a total eclipse of the moon can be seen for up to an hour and three-quarters. And a total solar eclipse only ever happens during the day, whereas a total lunar eclipse always happens at night... and here's our problem. Today's full moon takes place at 1.26pm GMT, when it's daylight in the UK, and the moon is below the horizon. Today's total eclipse starts at 12.52pm and ends at 2.08pm, which means here in the UK we won't be seeing any of it. Japan gets a great view in the evening, and the west coast of America gets a great view before dawn, but by the time the moon rises in Western Europe the eclipse will be long over. US media is rightly excited by the prospect of a total lunar eclipse, but again anyone cut and pasting their words for the benefit of a UK audience needs to add the caveat "but you'll see no blood moon here". Another total eclipse of the moon will be along in July, and that'll be the longest lunar eclipse of the 21st century, so that's something much more interesting to wait for. It will be visible from the UK, but only after moonrise, so we won't see all of it. Another one's due next January, assuming you can be bothered to wake up before dawn and look, and that'll be a so-called supermoon too. With 85 total lunar eclipses this century, you'll have every opportunity to see a special one eventually, but today is not that day. In short, today's "cosmic trifecta" is nothing special. Supermoons are not as super as you think they are, blue moons are not blue, and the blood moon isn't visible from anywhere in the UK. Our moon is a pretty amazing thing to see at any time of the year, a full moon especially so. But the idea that today's full moon is a super blue blood moon is, alas, nothing but lunar hype. 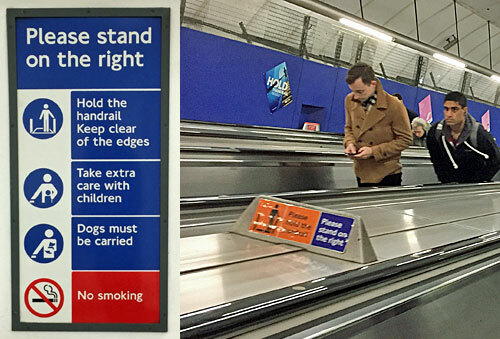 I first clocked TfL's new handrail obsession last September when this sign appeared at Liverpool Street station. It's still there, at the top of the main Central line escalator. 70% of customer injuries on escalators, here? That's quite a claim to make. What precisely was it about this Central line escalator at Liverpool Street, I wondered, which made it so appallingly dangerous? Then I noticed the asterisk. Of course there's a caveat, I thought, but what? There are 81 stations with escalators on the tube network. It didn't seem possible that Liverpool Street could be responsible for 70% of all customer injuries. Or was that not what they meant? There are 440 passenger escalators on the tube network. It didn't seem possible that one escalator at Liverpool Street could be responsible for 70% of all customer injuries. Or was that not what they meant? There are nine escalators at Liverpool Street tube station. It didn't seem possible that one of these could be responsible for 70% of all customer injuries. Or was that not what they meant? There are three banks of escalators at Liverpool Street tube station. It might conceivably be possible that one of these could be responsible for 70% of all customer injuries. Or was that not what they meant either? Indeed, what the hell did they mean? Here's what the small print at the bottom said. So, the statistics related only to the Circle and Hammersmith & City lines, data collected between April and August 2017, which narrowed it down a bit. Even so, there are 47 stations on the Circle and Hammersmith & City lines, so it still seemed peculiar that Liverpool Street should have such a massive share of the total. Except hang on a second, the Circle and Hammersmith & City lines are sub-surface, barely any distance below the ground, so there are hardly any escalators to be found. Sloane Square has two, and Westminster has some if you count escalators coming up from other lines, and maybe technically Baker Street and Kings Cross St Pancras and Victoria and West Ham, although it's stretching things to call these Circle and Hammersmith & City line escalators. So that didn't make any sense either. I had to delve into the Fit For The Future Staffing Model, not a document most customers passing through Liverpool Street have to hand, to try to explain what might be going on. For management purposes, only 20 stations fall within the Circle and Hammersmith & City group, essentially "the Circle line from Hammersmith round to Tower Hill, with the exception of Baker Street and King's Cross St Pancras". And those exceptions mean only two stations in the Circle and Hammersmith & City group have any escalators at all, specifically Moorgate and Liverpool Street. 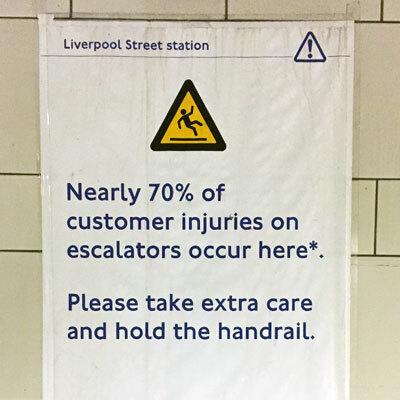 All the worrisome poster really says, I think, is that 70% of this group's escalator injuries occur at Liverpool Street and the other 30% at Moorgate. It is an internal statistic writ large, entirely out of context, full of sound and fury, signifying nothing. This is the kind of thing you might expect to see if you gave some 13 year-old schoolchildren a desktop publishing project. It is not what you expect to find on a world class railway. I went back to Bank/Monument yesterday and was pleased to see that the yellow laminated Be Prepared, You Are Approaching An Escalator poster has been removed, but the ridiculous Hold Your Luggage remains on the spiral stairs. 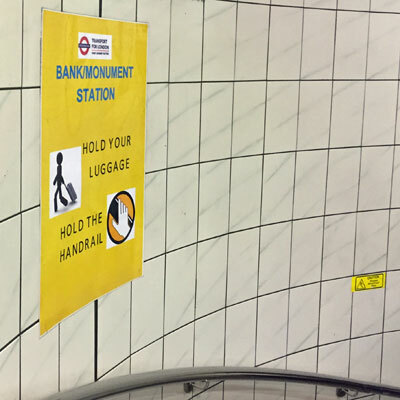 I walked down into Oxford Circus station from street level and passed at least five cheap-looking Hold The Handrail stickers on the stairs before I reached the ticket hall. At Euston I heard a message on the escalator urging me to step onto the escalator carefully, and hold my luggage, and position it on the step behind me, and hold the handrail, and step off the escalator carefully pulling my luggage behind me. This stuff is encroaching more and more. It makes sense to target safety on escalators, because that's where 40% of accidents on the tube occur. It makes sense to target the stations where most accidents happen, rather than blast out unnecessary messages across the network. It makes sense to "influence customer behaviour through direct comms", rather than let passengers continue to injure themselves. But has it all got a bit over-the-top, and the nudges too bespoke, rather than a coordinated professional campaign to keep us safe? To sample what's going on I paid a visit to the tube's three longest escalators. On each occasion I started outside the station and made my way down to platform level. Here's what I found. In short, it's very varied. 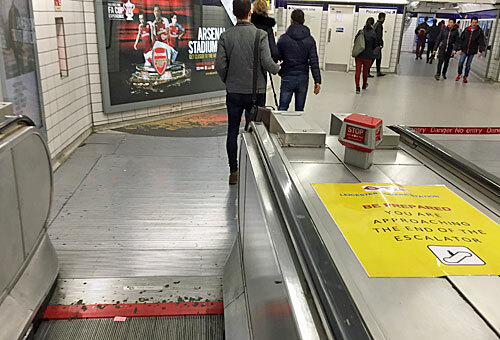 Holborn is one of the five stations with the most escalator accidents, so its campaign feels the most coordinated. At Leicester Square the Mad Laminator has been busy plastering over-reactions everywhere, with a general feeling of "oh that'll have to do" in where they've been located. Meanwhile at Angel there's absolutely nothing, other than the generic warning notice that's been at the top of every escalator for years. 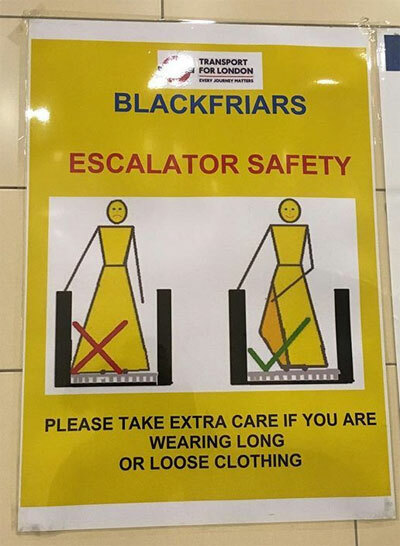 When the longest escalator on the Underground has nothing, and Blackfriars has crayonista stickpeople warning about loose clothing, it does feel like something is out of control. From what I observed, one of the main reasons people don't hold the handrail is because carrying a phone and interacting with it doesn't leave any hands spare. I apologise for mentioning this, because in some backroom somewhere someone may already be firing up the printer with posters saying Please Leave Your Screen Alone While You Hold The Handrail and Your Phone Is An Encumbrance You Must Put It Away. But if accident numbers are indeed going up, perhaps underground wifi is to blame, not escalators per se. Is a step-change in TfL's performance targets really best enabled by filling our eyes and ears with nagging reminders of optimal behaviours? Or is there a case for a generic escalator safety campaign, rather than hundreds of nudges appearing willynilly across the network? Just because it's possible to smother the Underground with health and safety messages, doesn't mean we should. Meanwhile, let's not forget that old favourite feature, Random London Bus Route, which has churned out this belter via North Cheam. Route 293 dates back to 1970 when long-standing route 93 was split into overlapping sections, this being the southwestern slice. 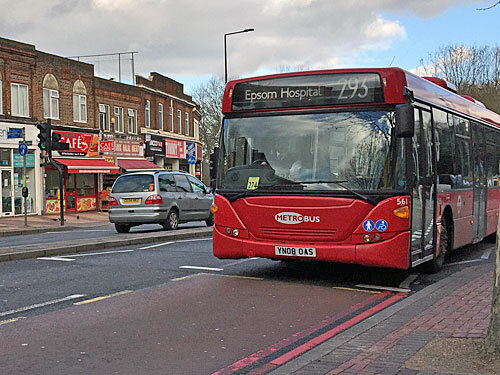 It's unusual in that half the route lies outside London, and while funding from Surrey County Council remains there are no plans for this to change. I made this journey last week before Please hold on, the bus is about to move was changed to Please hold on while the bus is moving, but for the record would like to point out that the former message played too late on 12 out of 22 occasions. In the text which follows, I shall mark each of these missteps with an [L]. Technically the 293 starts at Morden station, but in reality this means crossing the road and walking some way down the street. You can bide your time in the adjacent shops buying, or pawning, jewellery, or perhaps grabbing a takeaway from an outlet resembling a Wimpy, but for kebabs. The bus arrives empty from a stand outside the station, having U-turned around the necessary roundabout. It's a longer vehicle than I'm used to - not many London single deckers are the full 12 metres long - and has what look like cattle bars protecting either side of the exit doors. It's also reasonably busy, for a weekday lunchtime, so I'm hopeful I'll be able to stretch a narrative out of this. We have two buggies aboard already, so the driver plays his "please stay with your buggy" message in case either of the mothers dare to sit down. Plonked on one toddler is a woolly hat with endearing dinosaur ears, and on the shelf under the other is a bulging pile of Sainsbury's basics. An older youngster has also boarded, with Mum, who leads her to the back seat, then rings her husband and discusses Ellie's eating habits in some depth. At the second stop I have the misfortune to be joined by an Australian man, phone in one hand and a tray emanating foul spicy aromas in the other. It's all going great [L]. We break off from the main road round the back of the Civic Centre to serve the estates up Hillcross Avenue. The 293 was diverted this way in 2003, leaving the 93 to pick up down London Road, if you were wondering. The local housing aesthetic is quarter-detached houses, i.e. what look like semis but bundled into fours. I spot a white van outside one with the almost-coveted numberplate KHH4N. [L] At the crest by the park there's a half-decent view across Lower Morden, before we descend down the hill to merge into it. Here the driver has to brake sharply to avoid an oncoming vehicle, although no warning message has played in advance of this unpredictable event which is clearly sub-optimal. The bus stop at the roundabout is called The Beverley, despite the pub alongside having been renamed the Morden Brook, despite there being no such river. [L] Ahead lies more quintessential suburbia, as you'd expect to find anywhere with the gall to call a street Tudor Drive. Little cul-de-sacs nose off to one side, their paved-over gardens proving large enough for two family cars. We pass the gates of the Merton and Sutton Cemetery, so large it caters to two boroughs, then sweep unexpectedly into a light industrial zone. Here men in overalls collect fried lunch from a truck before returning to Tolworth Fencing and Gas Cylinders (Wimbledon) Ltd for the afternoon shift. Our residential deviation finally complete, we turn right onto the main road, and will proceed to follow the A24 almost all the way to Epsom. Where we are now is North Cheam, a less endearing sibling of Cheam proper, with an intermittent parade of shops strung out along the arterial. I spot Cheam Express, Cheam Angling, Cheam Hardware and Cheam Arena, the latter previously deemed one of the UK's filthiest supermarkets. [L] A fresh buggy boards here, whose owner stands as requested by the automated message, then almost falls over at traffic lights while her daughter grins. Epsom town centre is where almost all the remaining passengers wanted to go. They nip off with hemp bags flapping, seeking out the shopping centre or the market beneath the clocktower. Those of us hanging on to the bitter end get to see the rear of House of Fraser, and the back of Waitrose, on the extra half mile to the hospital. 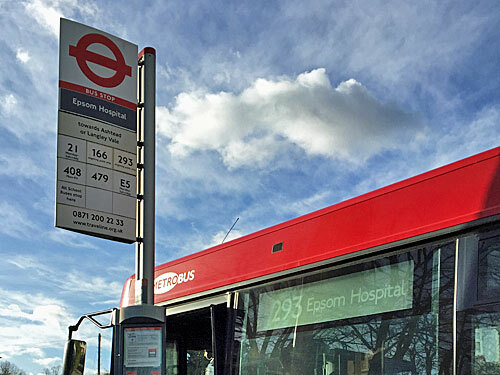 London bus routes like going to hospitals, which is the only reason we've come this far, pulling up outside the unimpressive facade of Epsom General. The other bus to terminate here is the hourly 166 from Croydon, which is pencilled in for abolition, but the 470 will apparently be nudged here instead so all is not lost for the sick and unwell of Sutton. I walk back into the town centre, rather than queue at roadworks, delighted to have been able to get out this far on one Oyster swipe. First off, Fairlop station is lovely. It wasn't originally part of the Underground, so bears the mark of the Great Eastern Railway in the bracketry, and its canopied platforms retain a proper rural Edwardian feel. 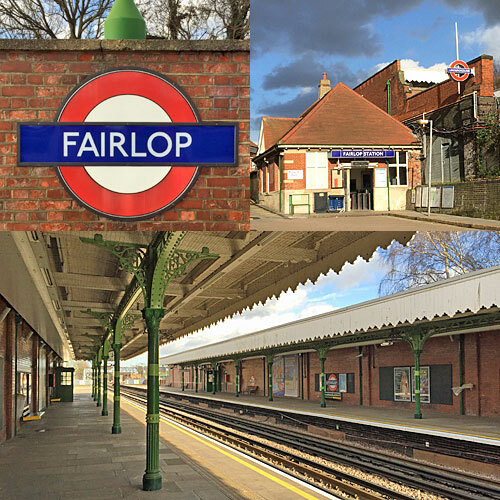 Indeed Fairlop is the only tube station in London to be entirely surrounded by Green Belt land, hence much of its catchment area is undeveloped, and it's the least used station to have a Night Tube service. For my first random station visit I'm exploring a thin splinter of land sandwiched between Hainault and Barkingside, approximately defined by Fullwell Avenue and Forest Road. I may not have hit gold, but the environs of Fairlop station are definitely silver. I think this is my favourite public library anywhere in London. It squats beside the roundabout at Fullwell Cross, a lowrise rotunda topped off with a startling copper lantern. 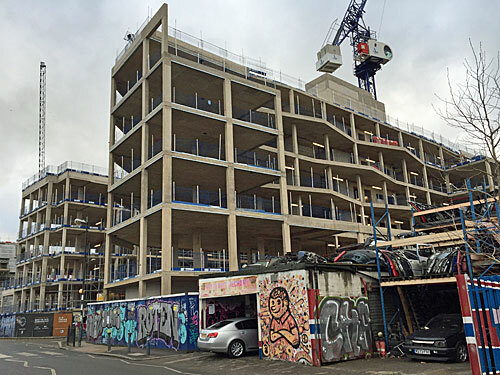 The outer section is finished off in concrete, with slit-like vertical windows in a semi-regular sequence. The central crown comprises sixteen folded curves, symmetrical like a seashell, above a ring of arched windows to channel illumination within. 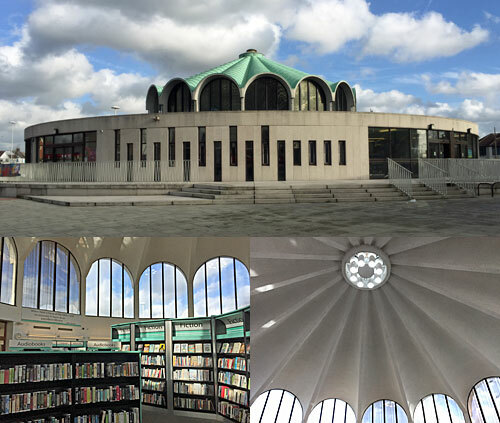 This alien book repository was designed in the 1960s by the great architect Frederick Gibberd, whose most famous building is the echoingly similar Liverpool Metropolitan Cathedral. He also designed the swimming pool in the leisure centre nextdoor, which is twice the size, but nobody ever stands in awe of the swimming pool. I'd passed by on several occasions and never gone inside, but on this occasion I remembered that libraries are public buildings so I'd be more than welcome. My opinion was not diminished. The heart of the building is the central circular space beneath the lantern, brightly lit, with an outer wheel of bookshelves and a second set of standalones curving within. A series of inspirational quotes, by Sir Arthur Conan Doyle, Virginia Woolf et al, spin round the rim, and a particularly pleasing shade of light blue has been used for highlighting detail. A librarian oversees from a side desk, not necessarily in line of sight should you wish to grab a photo. Various rooms lead off around the perimeter, some for staff, some for meetings and one the children's library. One deliberately large area now includes a bank of public computers, whose internet facilities were being particularly well used (for a weekday lunchtime) by students and silver surfers alike. One of these older gentlemen left the building at the same time as I did, and stopped for a chat when he saw me grabbing one last picture. "It was done by the same bloke who did Harlow," he said, "there's a plaque inside." We mutually appreciated the architecture, then progressed to wondering why the police were talking to a large group of boisterous teenagers assembled outside KFC, and then I moved on. The New Fairlop Oak: The tree in the centre of the roundabout is modern replacement for the ancient oak which marked the site of a raucous July fair in Georgian times. For further info, see my previous post. The local Wetherspoons retains the name. The Ace-State Cinema: This Art Deco 'Cathedral of Motion Picture Arts', opened 1938, was part-transformed into Gala Bingo in 1984. John will tell you more in the comments. Byron: A quirky gents hairdressers, self-styled the The Demon Barber of Fencepiece, its window stacked with bygone curios, cutout moustaches and customer headshots. Kantor King Solomon High School: This modern Jewish orthodox secondary school, whose pupils sometimes lunch at KFC, includes an Amstrad Technology Wing paid for by former chair of governors Lord Sugar. The suburb of Clayhall sits at the centre of the Hainault Loop, invisible to anyone whose view of outer London is coloured by the tube map. Where the houses eventually stop, and the land rises up towards Essex, are the extensive acres of Claybury Park. This is all that remains of the landscaped grounds of Claybury Hall, not that Humphrey Repton thought the area needed a lot of landscaping, and he seems to have received his salary for doing little more than hedge removal. Whatever, the park is a treasured combination of open heath, wooded slopes and ornamental water, not particularly at its best in January, but tons better than your average local rec. I wandered the end of the park my quest allowed me to visit, skirting the adventure playground where some AWOL schoolkids were holding court by the sound mirrors. Instead I headed into the woods, impressed by the contours most of East London doesn't have. In appropriate months the undergrowth is amok with bluebells, wood anemone and the rare Forster's Woodrush, but I only have the nature trail leaflet's word on that. 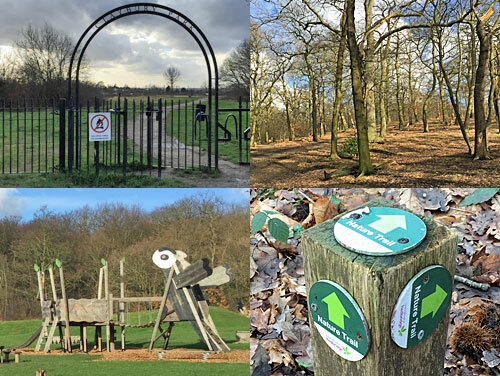 It is an excellent nature trail leaflet, however, and the number of mapboards scattered round the park makes it easier to follow than it should be. The northern edge of the park rubs up against the former Claybury Hospital, a Victorian asylum metamorphosed into a plush gated development. Its residents can pop down into the park at certain points with the aid of a key, whereas mere plebs who want to head north are stuffed and have to go round the long way. 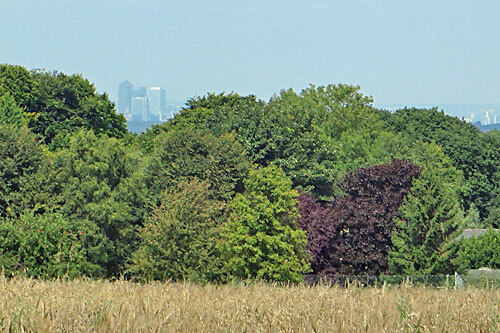 Thwarted, I traipsed along muddy tracks to an open plain with views towards Kent, then discovered a better spot (near the orchard) where the skyline of central London was arrayed along the horizon. What a treat to have Claybury Park on your doorstep, as I suspect outer Redbridge's dogs know well. 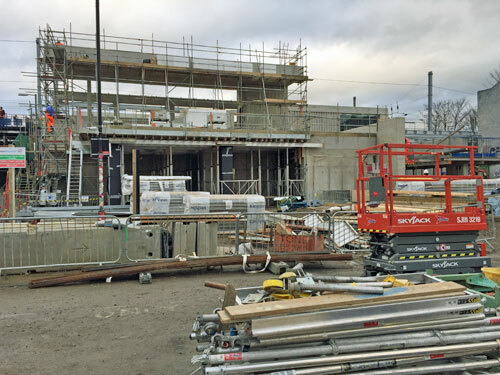 Redbridge Sports Centre: If you can't build on the land beside the railway, play sport. 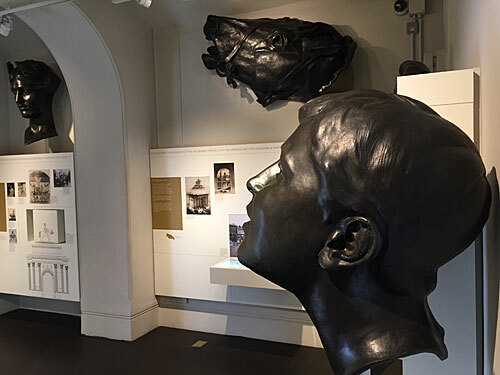 The RBC has filled the space to the west of the station embankment for over 40 years, with a broad mix of facilities and buildings named after not especially famous people. The gym and squash courts are in Norman Booth, badminton and netball in Jean Brown, astroturf and hardplay in Norman Clarke and refreshing cappuccinos in his wife Edna. The combination of 26 indoor and outdoor courts is why the Essex County Lawn Tennis Association is based here, despite this not actually being Essex. The whole complex is busy even on weekdays, as school minibuses and swinging kitbags attest. I was initially impressed that parking cost only £1 for three hours, but it had been free until a year ago, and regular users continue to be outraged. 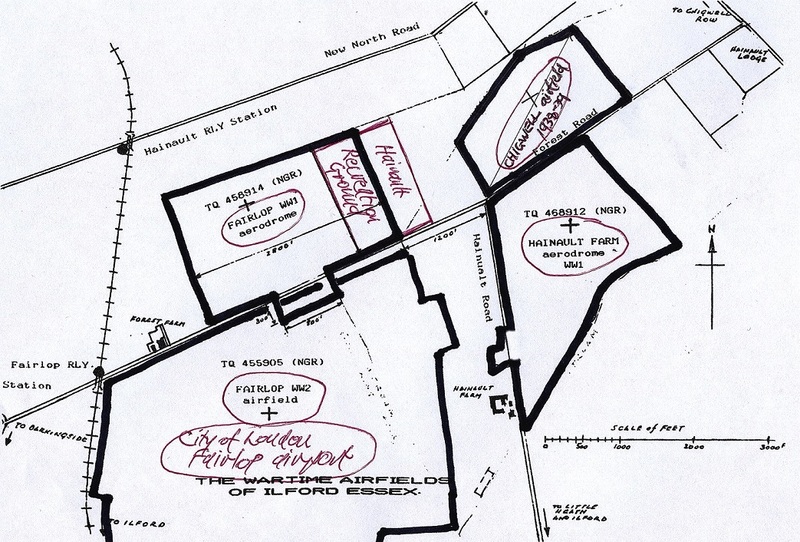 In the 1930s the flat agricultural land of Fairlop Plain was deemed ideal for the construction of a new London Airport. 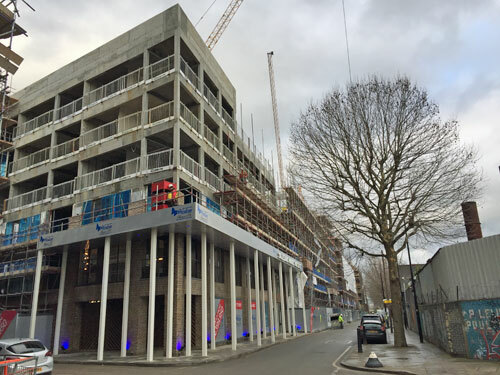 Plans were drawn up for a "super-standard" facility with 2000-yard concrete runways, and Ilford Borough Council were more than keen. Then of course World War Two intruded, which means the runways got built but for bombers, and several Spitfire and Typhoon squadrons were based here. After the war Heathrow and then Gatwick took precedence, and the redundant RAF Fairlop was used for gravel extraction instead. 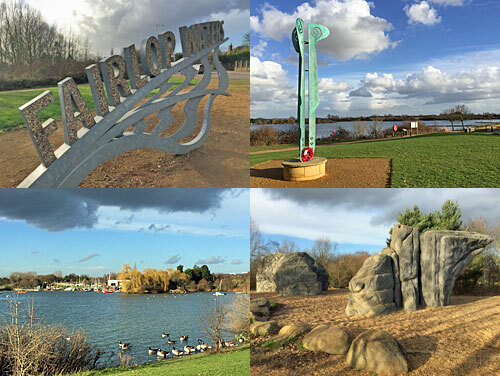 More recently those unruly pits have been filled in to create lakes and a golf course, and the end result is Fairlop Waters Country Park. It's got a bit of everything. Lovers of watersports will enjoy the rowing club and sailing club, while a huge climbing tower allows abseiling and high ropes action. Parents with toddlers deem one circuit of the main lake ideal for stretching littl'uns' legs, allowing regular stops to flail towards the ducks and geese on the waterside. Golfers have their own sideline empire, including driving range, and a clubhouse offering lager and Greek cuisine. And anybody teenage-spirited will appreciate the boulder park, the UK's largest, where nine gnarly concrete 'rocks' provide adequate challenge for experts and scramblers alike. The all-weather path proved ideal for January, as my attempts to wander off-piste grew increasingly squelchy. Even the golf course had gained a few additional water features, so my attempt to yomp across to the nature reserve had to be abandoned. 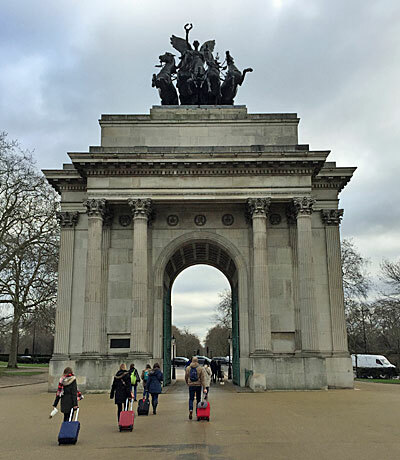 Instead I dropped by at the WW2 memorial, and wondered what some of the information boards had said before they were ripped off, and nodded in recognition to young couples and elderly ladies heading clockwise as I passed them for the second time. On departure I noticed that the letters of the Fairlop Waters sign are infilled with gravel, which is a nice touch. And hurrah, the station really isn't very far away. I've been looking for a new idea for 2018, a fresh seam to blog, and I think I've got one. You suggested dozens of ideas back in December, some of which I've definitely lined up to maybe tackle one day sometime, not necessarily soon. But this project is more of a long term slow burn thing, nothing to dash through in one year flat, indeed I'll likely never get anywhere near the end at all. It's really simple. It's Random Station. Specifically that's Random London Station, which avoids having to head to Hartlepool at a moment's notice. Basically it's every National Rail station plus everything that's on the tube map (excluding anything outside Greater London, and the two ends of the Dangleway). I'm also only including a station once, so for example West Hampstead is a single entry on my list, even though it's technically three separate sites. But throw in DLR and trams and Overground and all the minor runty lines out into the suburbs and that's well over 500 stations I could potentially visit. Specifically my list starts with 252 tube stations, followed by 40 additional DLR stations, then 77 Overground stations not yet included, then 37 tram stops, then 185 other stations served only by National Rail services - a grand total of 591. So what I'll be doing every time I feel like a Random Station visit is using this website to pick a random number from 1 to 591, scanning down my list for the appropriate row, and going there. You don't need to see my spreadsheet, just rest assured that everywhere has an equal chance. In bad news for Men Who Breathe Railways, the resulting post won't be about the station. Instead I'll be exploring the area roundabout the station and writing about some of the most interesting places there. Specifically, the area I'll be exploring will be anywhere that's nearer to my station than to any other station. This is the brilliant bit because it adds a quirky layer of map geekery, because the region so defined isn't immediately obvious. For example, if my first station were Queensway then the area I'd be exploring would be the yellow polygon on this map. 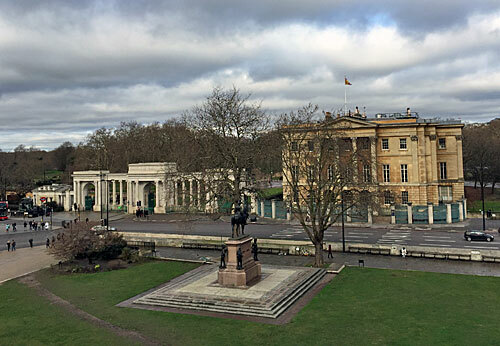 Anything to the west is nearer to Notting Hill Gate, anything to the north is near to Bayswater, anything to the east is nearer to Lancaster Gate, and then High Street Kensington slices off the southwestern corner. That would leave me a bit of the Bayswater Road to explore, and a lot of Kensington Gardens including the Palace and the Round Pond. Having to write a blogpost about these 140 acres would be a challenge, but that's random interspatial polygons for you. In good news, TfL have made another adjustment to London's most infuriating message. Please hold on, the bus is about to move. In bad news, they haven't turned it off. Nor have they tweaked the timing to linked it to the closing of the doors. Instead they've changed the wording, starting from this morning, and it now says this. Please hold on while the bus is moving. Now it no longer matters whether the bus has left the stop or not, because the new message is entirely time-independent. If you're halfway down the road when the message plays, or still minutes from setting off, that no longer matters. Ditching the phrase "is about to move" has solved the problem, as should have been obvious to whoever set the trial up. It'll still be repeated as often, so will continue to piss off everyone who's annoyed by relentless intrusive safety messages. But it won't be laughably, mind-numbingly incorrect, so that's a result. Amusingly, Please hold on while the bus is moving is one of the alternative messages I proposed on this blog ten days ago. It would be amazing, or entirely cringeworthy, if London's newest viral irritation were somehow my fault. In mitigation I would like to state that I nabbed the wording from a tweet by @rhyssmith55, so he should get the credit, if indeed this is the source. @TfLBusAlerts @TfL these new ibus announcements should really say 'please hold on while the bus is moving' this bus I'm on now is proper bouncy!!! The new message marks an intriguing shift in the focus of TfL's four-week safety trial. Previously it was all about the moment of departure, urging to hold you on as the bus set off from the stop. But the new message is much more broad, targeting not just changes of speed but every moment of forward motion. And this refocusing means that the advice now being given remains mostly unnecessary, most of the time, for the majority of bus passengers. If you're boarding a bus, or attempting to move towards the doors before it stops, then it certainly pays to hold on. If the bus is busy and you're standing up, then maybe it doesn't hurt to be reminded to hold on at extremely regular intervals. But if you're sitting down then you do not need to hold on, not unless the driver is driving really badly, which they've been specifically trained not to do. Indeed depending on what kind of bus it is, and where you're sitting, there may not even be anything for a seated passenger to hold on to. Please hold on while the bus is moving may be an improvement, but is still poorly targeted and remains annoying aural overkill. We're now at the halfway point in TfL's trial, thankfully, so should only have to endure this noise pollution for another two weeks. But this is the second time they've changed how the trial works - once the timing and once the message - so I hope they're not hoping to put too much trust in the resulting data. On average 'only' 60 passengers each week suffer a trip, slip or fall on a bus, so it'll be nigh impossible to prove whether any reduction in accidents is the result of random fluctuation, the message itself, or the enormous publicity backlash this misguided trial has generated. It's time for a reminder that people sometimes email me suggesting I write about the thing they're paid to promote, and I am never interested. Here are some of the things these people think I might be interested in. I’m just reaching out to let you know that there is a new rehearsal facility in South Wimbledon for musicians in and around Wimbledon to use. Here’s a link to a short break down of what we offer. I don’t know if you have anywhere I could post this up for the locals to see? I told Ben I didn't have anywhere I could post this up for the locals to see, and he seemed satisfied with that. My blog is not the place to showcase fabulous bakery campaigns, Lizzie, however worthy. Congratulations on meeting your crowdfunding stretch target, btw. Just wanted to give you a heads up about <Thing I already know about>. <Yes I know this too.>. <Yes I know all of this as well>. Let me know if this is something you are interested in posting on your blog. If I were interested, Samantha, I would already have featured it. Now that you've mentioned it, I never will. I wonder if this is something that you might feature on the blog? Hang on, what? But that's all Mark wrote. Only when I clicked on his Word attachment (sheesh) did I read "London Bridge SE1 is the go to destination this week for seeking out a real bargain if you are in the market for some luxury British furniture", and then his email went straight in the bin. I’m the Community Manager with <Digital Marketing Agency>, where we specialize in connecting established brands with prominent bloggers. We are inviting a group of select bloggers to share their perspective on the future of mobile apps. Would your readers enjoy your perspective on how mobile apps will evolve in 5 or 10 years? Also, if you have a media kit, please kindly share it with us. We would really like to know more about your blog for this and other similar projects. My 'media kit' consists of a giant thumbs down emoji and a sarcastic Simpsons gif. I resisted sending it. Could you give me a call in the week, I'm interested in chatting about your blog? 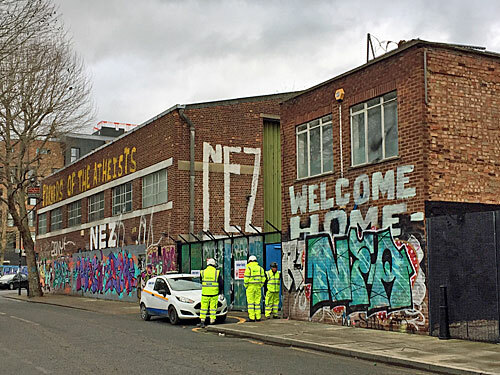 Christian's email offered no clues what the call might be about, other than a website in his email signature which claimed to be an online platform showcasing London's iconic West End. I emailed back "Er, not without a good reason, no...", and I've not heard anything since. My name is Mark <Surname> and I'm a producer with <Ridiculous Name> Immersive Escape Experience, London. I'm reaching out to the most influential trendsetters in London to see who would like to come and try our experience with no charge in exchange for sharing your experience with your audience. We are going to run a series of missions especially for you and other youtubers so it would be a great opportunity to network with others in the industry and use each others reach to expand your audience. Lovely though it was to be deemed a trendsetting youtuber, I had to disappoint Mark on this occasion, and all future occasions. It's what calendar apps do, isn't it, launch a street art exhibition? I hope you read all about it on the Visit London website instead. I'm Tamara from the marketing team at <Inadequate Website>. We are the new London Tube planner that enables users to <inaccurate claim>. There are two types of collaboration that we are working on to create synergies together and to get increased numbers of visitors for both our services. Tamara wanted me to "briefly introduce" her tube planner site with video/photo content about my experience using it, add a direct link to her site and include all the designated hashtags. You may have noticed that I have not actually done this. You may also have noticed I have not plugged any of the other things. Please do not send your marketing emails to me, we will only laugh at you. 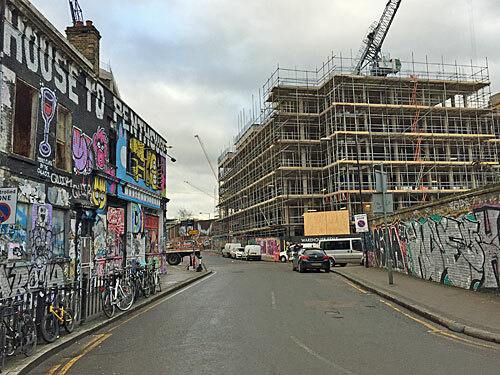 Today's post is about the post-industrial edgelands to the west of the Olympic Park, specifically Hackney Wick and Fish Island, specifically how its buildings are being demolished, relentlessly, and rebuilt into flats, sucking away character to create another identikit district of over-priced boxes, admittedly necessary, but crushingly dull compared to the previous characterful vibe, so if you could just bear that subtext in mind throughout what follows, that'll save me having to mention it in every paragraph. 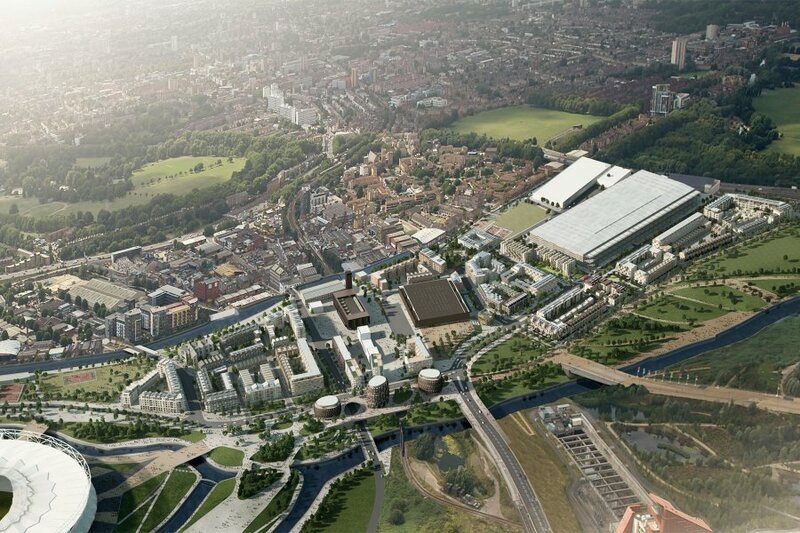 Planning concessions hereabouts ensure that light industrial uses are being retained, if somewhat lighter than before. 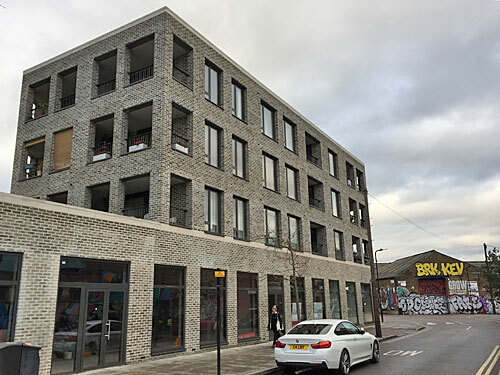 A prefab community centre has recently been thrown up in Hackney Wick as a hub for youth and yoga. 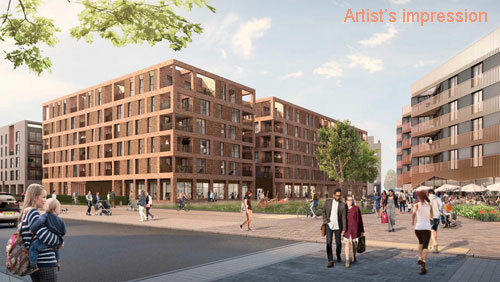 But this is really all about realising the Lower Lea Valley's full residential potential, as was always intended post 2012. 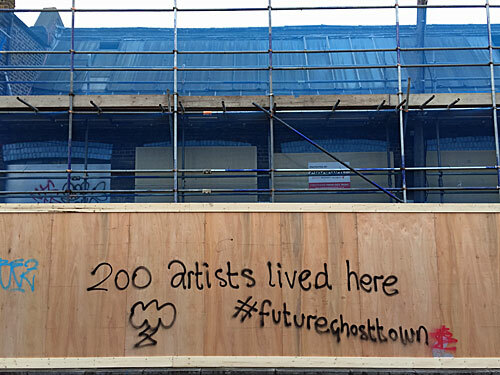 Developers may claim this is "an evolutionary legacy for the people of East London", but its former creative community would claim otherwise. The phrase "health and safety gone mad" is often overused. But have a listen to this, which I recorded yesterday at Bow Road station, and see what you think. It plays every 15 minutes. In case you can't hear, or the speech is somewhat indistinct, here's a transcription. I fear "gone mad" may be an appropriate description. Welcome to Bow Road, says the voice, before warning that simply being at this station might actually be dangerous. Please don't lose concentration when moving around the station is a new one on me. I assume it's aimed at the zombies who walk around with their heads in their phones, except they've probably got their headphones in so will never hear the warning. 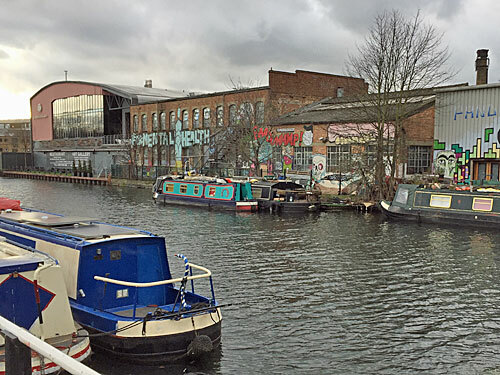 It could equally refer to people distracted by talking to one another, parents with small children or anyone daydreaming about being somewhere nicer than a tube station. Please don't lose concentration... is also a woefully unspecific request, which could apply to almost any situation where risk is present. Please don't lose concentration when carrying out open heart surgery. Please don't lose concentration when crossing the road. Please don't lose concentration when slicing a carrot. Please don't lose concentration when ironing a shirt. Indeed Please don't lose concentration could be played on endless loop on every public address system in the world everywhere forever, and is so wilfully generic as to be of almost no use. Please take care when using the stairs is more usual, or at least it is these days. A badly-tackled set of stairs can bruise you, or cause serious injury, or even end your personal mobility for good. 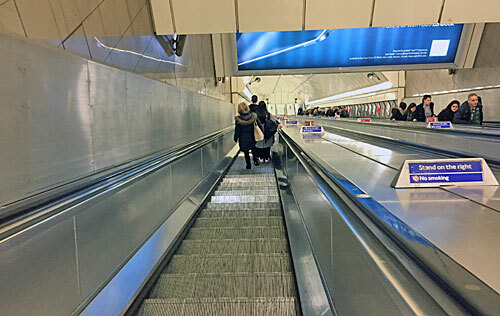 TfL know that if they can reduce incidents on stairs they could significantly improve the tube's accident statistics, which is why this message now plays out so often. Equally, the folk who normally run down, or tackle them three steps at a time, probably aren't listening and never will be. Please never fail to use the handrail is very odd wording. Everywhere else across the network it's "hold the handrail", whereas the announcement at Bow Road uses a negative, as did that first announcement Please don't lose concentration. Don'ts and Nevers certainly make these messages much harder to take in. I also think that Never fail to use the handrail is ridiculously strong, suggesting that walking up or down stairs unaided is always wrong. We're not all staircase angels, nor need we aspire to be. What's more, here at Bow Road it can't be done. If TfL are so keen on us always holding on, perhaps they should add a handrail at the entrance to the station, where the two steps up from street level must have been potential deathtraps since 1902. What next? A poster urging you to Hold your luggage? Why yes, here's one. This lunacy has appeared at Bank, on the spiral staircase down from the Central line, on a wall which has been liberally scattered with a wide selection of trip hazard stickers. What alternative is there to holding your luggage? Unless you drop it for a laugh, it's not going to reach the bottom by itself. It seems someone at Bank/Monument has got themselves a poster-making kit, because there's been an outbreak of laminated yellow screeds around the station of late. Here's another one. 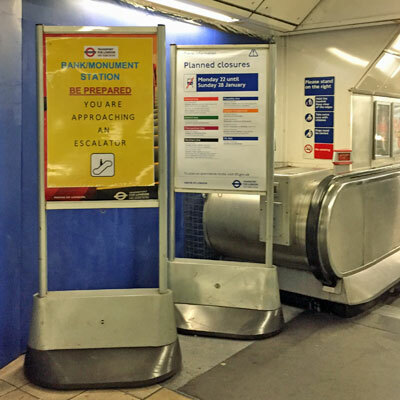 This one appears just before the escalator down to the Northern line from Monument, and warns Be Prepared, You Are Approaching An Escalator. Most of the time this should be damned obvious, but it is just possible that at extremely busy times someone might not notice. What's futile is that the poster doesn't advise how to travel on the escalator, merely notes that you should adjust your mindset appropriately. It's also been stuck over the top of a Hold the Handrail poster, as if that were somehow less important. What the hell is going on here, and who on earth gave the go ahead? It seems a tipping point has been reached, not just on the tube but on the buses, as TfL scatter health and safety messages willy nilly where they've never been needed before. Please hold on, the bus is about to move is the most infamous, but is merely the latest manifestation of a patronising mentality being rolled out across the capital. The Mayor has given TfL tough targets to reduce accidents on public transport, and their most prominent response has been to tell us all how to behave in situations they'd never have bothered us with previously. This is why they're now insistent that we hold on every time a bus is about to move, this is why handrail-holding has attained mythical levels of importance, and this is why some disembodied voice at Bow Road now wants everyone to maintain their concentration. A risk-based management culture will always demand that more and more warnings are given, because not to do so would be suboptimal for meeting customer safety targets. But the latest outbreak of ludicrous messages has surely crossed a line, as TfL deliberately pollute our commutes by repeating the bleeding obvious. On a sliding scale of preposterousness, where will it end? I walked this particular stretch of the North Downs Way back in August, but never got round to writing it up at the time. I hope my summer reminiscence will be the perfect antidote to a dull, grey, sleety January. The last time I left you, which was six months back, sorry, I'd reached Westerham Hill. 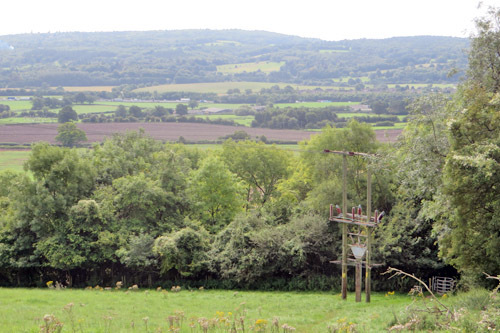 The top of the hill is the highest point in London, and very close by is Betsoms Hill, the highest point in Kent. Plenty of traffic careers down this steep winding lane, plus the number 246 bus, and it'd be several miles before I saw another road even vaguely as busy. The footpath set off up the edge of the adjacent field, on this occasion liberally spread with flung manure, so I was glad it hadn't rained for days. A pheasant sauntered across the harvested furrows, safe from being shotgunned until the season started up again in October. Before long the path turned right through a wood, emerging briefly to watch a rumbling tractor, then climbing 45 steps and a steep field. There is a lot of up and down on the North Downs Way, which is rarely content to follow the top of the escarpment for long, but thankfully is about to for a while. The view was excellent from up here, all Wealden valley and the roofs of Westerham, though augmented by the incessant hum of the M25 reverberating around the scarp. 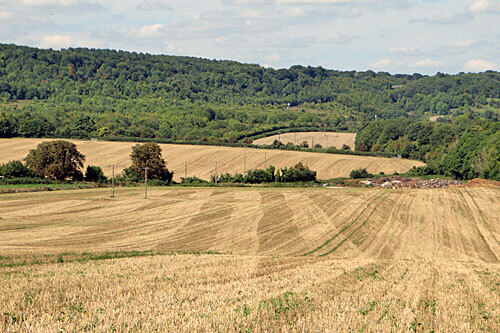 The very top of the ridge marks the Greater London boundary, the only half mile of the North Downs Way which brushes the capital. A handful of architecturally unlovely homes lurk in these edgelands, their back fences pinned with warning notices and requests for planning permission. Joelands Wood contains the most southeasterly point in London - look for the concrete sign set into the earth directing the NDW right into Kent. What follows is a rutted farm track, then the top of Hogtrough Hill, then copious cowpats confirming you're sharing a field with cattle (and some inquisitive horses). Across the farmland ahead I could see a plume of smoke rising into the sky, thin and white. I initially assumed it was nothing untoward, and that the distant sound of sirens was entirely unconnected. But the neenaws grew louder, then ceased just out of sight behind a phone mast, towards which the fastest tractor I've ever seen was storming. When I finally caught up I found a group of helmeted men attending to the seat of a small fire, two engines parked alongside, and farmhands attentively looking on. 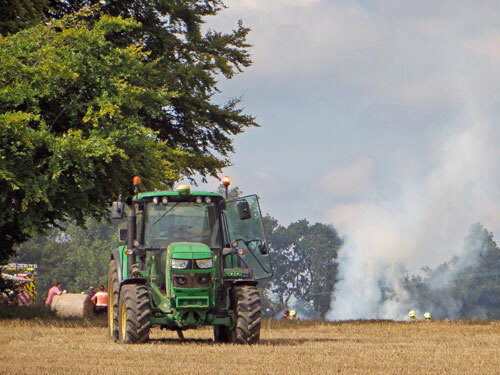 Thanks to the wonders of the Kent Fire and Rescue website I now know that this was "a fire involving an agricultural baler and some straw alight in a field", cause unknown, and with no reported injuries. Amazingly this turned out to be the only reported fire in Knockholt in 2017, and I just happened to have rambled through during the twenty minutes the incident was live. 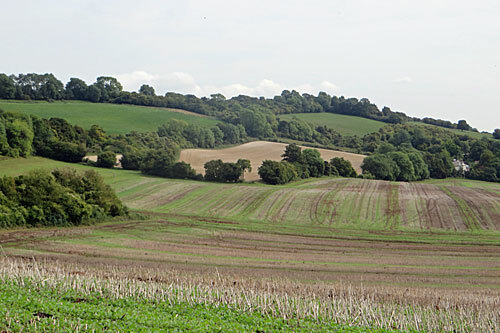 The village of Knockholt is a couple of miles long, and the North Downs Way shadows it in parallel across a field or two. It was here that I met my first rambler of the day, or rather dogwalker, because not many people hike long distance paths on Tuesdays. The towers of Docklands occasionally poked up clear as day above the treeline, even though they were 15 miles distant, and from other angles the Gherkin was almost as distinct. But all the best views across the Weald were blocked off by a thick screen of trees, apart from one brief slot deliberately cut through, too deep to be able to funnel anything but leaves. 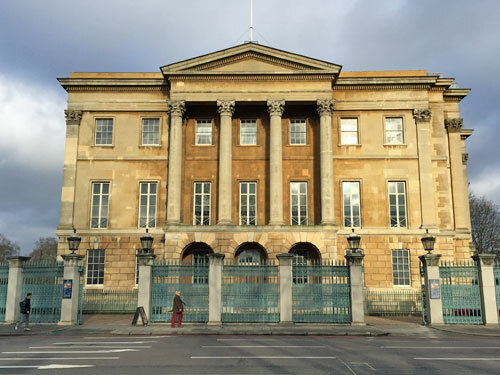 What's obscured immediately below is Chevening House, a stately home in landscaped grounds, bequeathed to the nation in 1959 and traditionally the Foreign Secretary's country bolthole. Perhaps it's just as well those trees ensure that that Boris isn't sniperable from above. 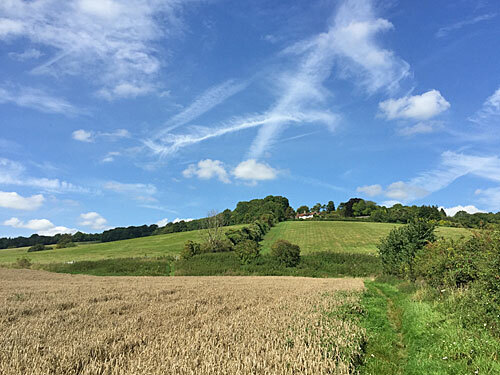 But eventually a footpath or two is allowed down, and then the North Downs Way makes a break for the top of a glorious swooping field. 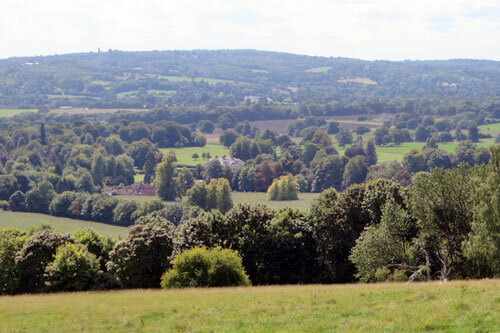 Now I could see for miles back along the ridge of the Downs, and over the Chevening estate with its perfectly managed trees, and across the hump of the Greensand Ridge rising in the distance. I rested awhile on a convenient bench in twenty-five degree heat. Blackberries ripened on the bushes behind me, not quite yet ready to pluck. A bird of prey hovered beneath a sky of fluffy cumulus, its eye on potential lunch options in the thick grass below. 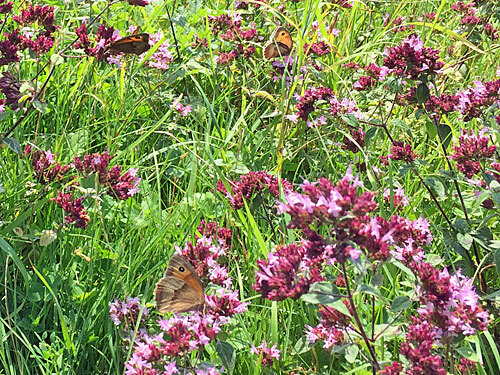 On one bank the wild flowers were liberally scattered with butterflies - I've rarely seen quite so many - dancing from one purple head to the next. I hope my flashbacks aren't making you feel too wistful for the summer, but rest assured what's currently grey and brown and waterlogged will before too long be green again, and and ripe for a pleasurable short-sleeved stroll. Time to head down, steeply down, past hedgerows and fenceless stiles to the flat valley floor. An abrupt change lay ahead, beyond a mess of farm outbuildings, the footpath ending on a busy pavementless road. The M25 runs immediately behind, the seething orbital I now had to cross for the final time (just before the carriageways split at Junction 5, the intersection with the M26, if you're counting). If felt odd to be back down in an actual village, namely Dunton Green, now more a commuter cluster with a few old cottages at its heart, plus the kind of big pub you drive to for a steak. Escape came up the side of a hotel with ideas above its station, including a plaster elephant out front and a grinning buddha water feature in the car park. It was good to be back out in rolling fields, even if they'd have looked finer before the crop was harvested and the earth left closely cropped and cracked. I was aiming for the bridge over the railway to Sevenoaks, beyond which the remoter residents of Otford hide away. Telston Lane conceals a peculiar secret just beyond the post office, a pillar representing Uranus, part of the wonderfully-realised scale model Otford Solar System. 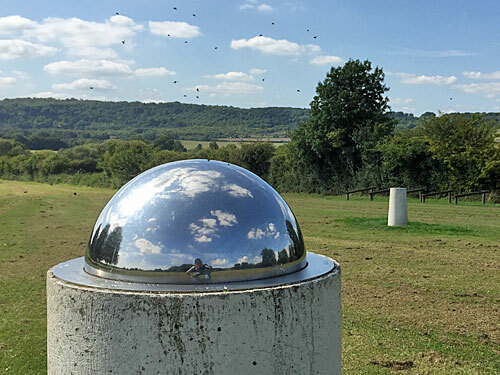 This mirrored dome at the edge of Otford Recreation Ground, plagued by tiny flies, represents the Sun, and that's Mercury in the background. I was pretty much at the end of my walk by this time, so had time to deviate and explore the inner planets without all the distractions I endured the last time I was here. 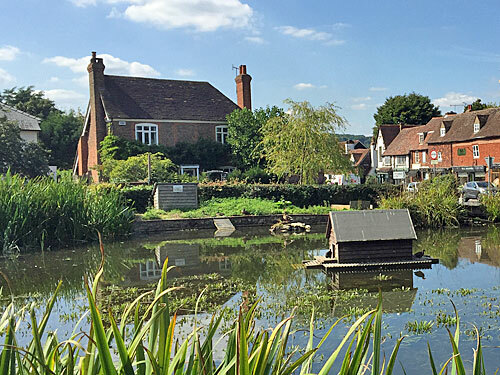 Most visitors to Otford prefer the tea shops, pubs and village green, this being a particularly attractive settlement nestled in the historic Darent valley. It's also easy to get home from, there being trains, a luxury rarely repeated on what lies ahead of the North Downs Way. Time to hibernate the project for the winter, five months on. In good news, TfL have made adjustments to London's most infuriating message. In bad news, they haven't turned it off. Nor have they changed the message, nor have they linked it to the closing of the doors. Instead all they've done is tweak the timing, and so their misguided four week trial rolls on. For the first week, the message played approximately 20 seconds after the doors opened, no matter whether the bus was about to leave or not. Most of the time the bus was already moving by the time the message played, hence it was plainly incorrect, which infuriated travellers almost as much as the interminable repetition. The specific sequence of events was that the doors opened, followed by a gap, followed by an announcement of the route number and destination, followed by another gap, and finally the message to hold on. Like so. What TfL did yesterday is to remove the second gap. The message Please hold on, the bus is about to move is now played immediately after the announcement of the route and destination. This has reduced the length of the chain of announcements from 18 seconds after the doors open to more like 13. Technically it's an improvement, because the bus is less likely to have moved off before the message plays. But has it solved the problem? Hell no. I've been out on the buses again to listen to new system in action, and can confirm that it's just as annoying and inaccurate as before. I rode the 205 from Bow down to Aldgate, and then the 25 back from Aldgate to Bow. At each stop I checked whether the message played before the bus left or vice versa, and by how much. Firstly, here's what happened on the 205. On four occasions no message was played, not even 205 to Paddington, which I assume was just a technical glitch. Of the eight times there was an announcement, one was spot on, four were late and three were early. On the occasion when the announcement came 8 seconds too late, this was because only one person got on, without faffing, and the driver pulled off almost immediately. On the occasion when the announcement came 18 seconds too early, this was because the traffic lights ahead of us were at red. One unfortunate passenger did stumble on the stairs, but this was on a separate occasion when we braked at traffic lights, and obviously the message doesn't play then. Here's what happened on the 25. This time there were 14 stops, and 14 announcements. On three occasions Please hold on, the bus is about to move was played just as the bus was about to move. On six occasions the message came too late to be of any use - even a one second delay is useless, because it's already wholly obvious that the bus is moving. And on five occasions the message came too early, on one occasion almost four minutes before we actually drove off! It might be instructive to explain how those last four "earlies" occurred. 21 seconds early took place outside Mile End station, where a long queue of passengers was waiting to board. 46 seconds early took place at Coborn Road, where one passenger got off and then the driver simply hung around, like he really wasn't trying. 4 seconds early took place outside Bow Road station, where nobody was waiting and nobody wanted to get off, but the driver stopped and opened the doors anyway. And 228 seconds early took place outside Bow Church station, where bus drivers on route 25 change over, but the message still plays before the first one leaves the cab. This is why linking the announcement to the doors opening, rather than the doors closing, is insane. Last week in a statement to the Evening Standard, TfL admitted it had "not quite got the timing right yet". "Clearly there are some adjustments we need to make and we’re working on that now," said their director of bus operations... which is why the interval has now been reduced by five seconds. Yes, the updated version of the trial means that the bus is more likely to be stationary when Please hold on, the bus is about to move plays, which makes the announcement sound less ridiculous. But the announcement is no more likely to be accurately timed than it was before - all that TfL have done is move the goalposts. Presumably it's not technically possible to link the announcement to the closing of the doors, at least with the software in its current configuration. Presumably the wording of the message can't be changed without damaging the set-up of the trial, despite only ever being intermittently correct. And presumably the trial is of such importance that nobody's willing to stop it early and turn these unrelenting messages off, despite the amended timings not solving any of the underlying problems. Please hold on, the bus is about to move is so regularly incorrect that passengers now recognise it as a false alarm. "Oh, there's that stupid announcement again..." they think, "...the idiots, the bus is already moving!" All TfL really seem to be managing with this new trial is to increase distrust, and make us instinctively less likely to listen to more important announcements. It's no use arguing that partially sighted passengers and the elderly appreciate these messages, because they'd only be of use if they were properly timed. Indeed there's already a more useful noise aboard a bus to warn people of imminent movement, and that's the beep of the doors closing. Instead TfL are simply out to remind us to "hold on" at every opportunity, because once in every two million journeys it might save someone from harm and make their statistics look better. TfL don't care that you hate the messages. They've been tasked with reducing the number of injuries on public transport, and this relentless nannying announcement is their response. It's also why the phrase "hold the handrail" is being bandied about with smothering regularity on stations and escalators. It's also why we get warned to watch out for slippery surfaces "due to the inclement weather", even if it hasn't actually rained for the last twelve hours. Safety targets mean TfL are determined to continue with their bus trial no matter how flawed it is. Our only hope is that at the end of four weeks somebody has the sense to turn the nagging racket off.